What is the app designer? Learn how to access the app designer in Fulcrum to create an app. 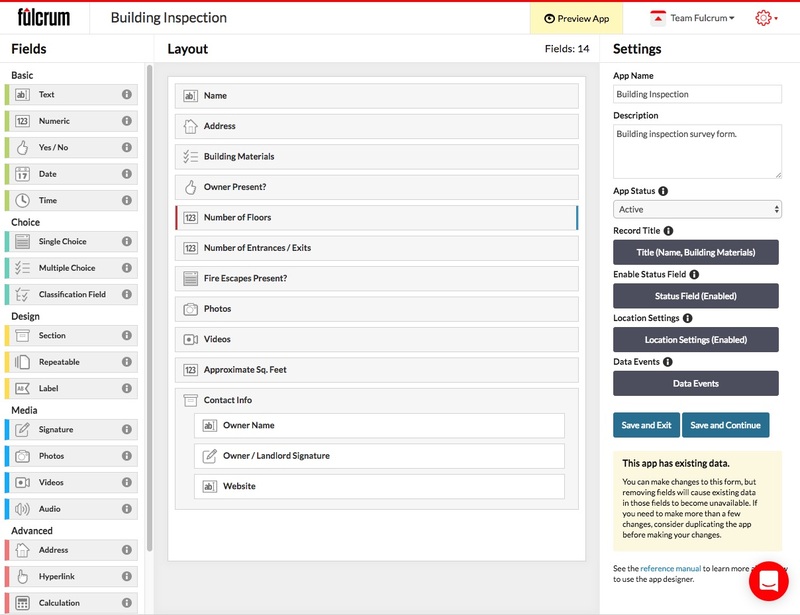 Fulcrum’s App Designer is a highly dynamic, yet super easy to use design tool for creating data collection apps. It gives users total control over the organization of data fields you want to collect. You can create your apps however you want, without writing a single line of code! To access the App Designer, login to your account and select New App button at the upper-right part of the homepage. The app designer is broken up into three main parts. Starting from the left side, you have the Fields section, then the Layout section, and finally the Settings section. The fields section contains the various field types that you can use to create your app. They are grouped to help identify their use. The fields in the section can be clicked on and then dragged into the Layout section. The layout section is where you place the fields that you want to include in your app. After a field is added to your layout you the fields options popup will display. In this popup, you can set the label (display name), data name, description, default value and various other options. Lastly, conditional logic can also be setup to dynamically control when fields/sections are displayed or required to be filled out. This popup can be access anytime by clicking on the field. Fields can be clicked and dragged to be recorded within your app. Fields can also be nested within sections or repeatable sections. In the settings section you will give your app a name and description. You can also set the status of your app. Below the app status option, you will find options for setting the record title, setting up the status field, the location settings, and a button to access the builder for your data events. At the bottom, you will find the options for Saving and Exiting the app designer, or Saving and Continuing, allowing you to save your current progress and continue editing the app. In the upper right corner is the Preview App button allowing you to see the current version of your app's design on the web app. It is still a good idea to test your app on the mobile device since there are nuances between the platforms. Be careful editing your apps with collected data in them! Depending on the edits that you are making, you could lose data. It is always a good idea to run an export before making edits to your app.